It could have happened, even if it didn’t. The film careers of George Lucas and Alfred Hitchcock did overlap for a few years there in the ’70s, so the two iconic directors could have collaborated on a project had they so desired. Officially, no such project exists, so it is up to fans to imagine what might have emerged from such a union. 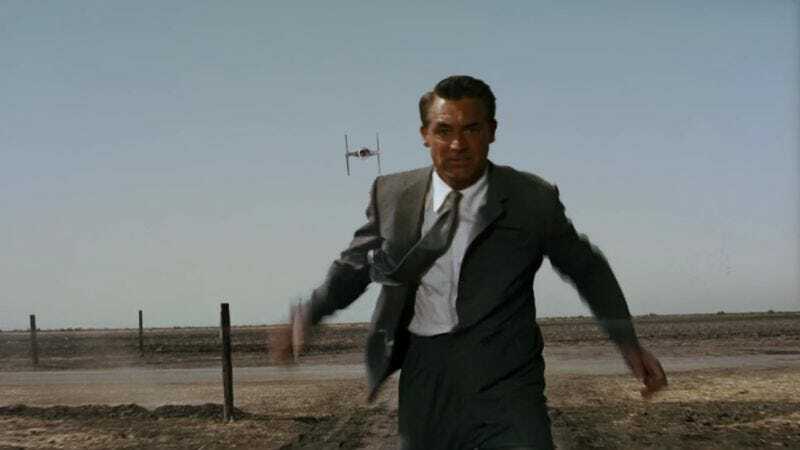 In that spirit, Fabrice Mathieu’s “Darth By Darthwest” is a brilliant mashup of Hitchcock’s 1959 thriller North By Northwest with Lucas’ Star Wars saga. Beautifully rendered, this six-minute film integrates visual elements from the Star Wars film into the iconic crop duster sequence from the Hitchcock film. At one point in Northwest, Cary Grant’s wrongly accused, hotly pursued character finds himself standing by the side of the road next to a cornfield. It’s a flat, dusty location, not entirely dissimilar to Tatooine. So why not just turn it into Tatooine? Add a few sarlacc pits here and there, maybe a moisture vaporator or two, a landspeeder, and a cameo appearance by Jabba’s Palace. Then all the scene needs are cameos from C-3PO and BB-8. Oh, and maybe a little Millennium Falcon action, too. “DARTH BY DARTHWEST”-“VADOR AUX TROUSSES”. Short Film. from Fabrice Mathieu on Vimeo. It wouldn’t do for Grant to be menaced by a plain, old, ordinary airplane in such a fanciful mashup, so Mathieu has him being pursued by a very persistent TIE Fighter instead. It’s not clear what Grant did to piss off the Galactic Empire, but it must have been something bad. Although there are lasers and robots and spaceships in this version of the legendary scene, the pacing and composition remain supremely Hitchcockian. That goes for the music, too. Mathieu has retained Bernard Herrmann’s score from Northwest rather than opting for the heroic John Williams-composed theme from Star Wars. Overall, this is a surprisingly harmonious marriage of two seemingly very different brands of filmmaking.